But let's keep it going! Lots of fun handmade goodies to be won today. First up, Ordinary Mommy. When picking favorites from Faith's shop, Ordinary Mommy, I thought about just "screen shotting" her entire storefront. Everything in this shop is colorful, beautifully made, and incredibly unique. She somehow makes things made from felt be easily translated into spring & summer. I love that Faith doesn't just make what's "popular" but is truly a trendsetter and it is obvious that she loves what she does because um...do you SEE this stuff?! BEAUTIFUL! Today, Faith is offering you guys a chance to win this little guy, valued at $25! I'd hang this on any door in a heartbeat. Even better, save 15% off your purchase at Ordinary Mommy with the code SONGBIRD. Next, we have Lots of Jewels. Cherie makes unique & stunning pieces that will quickly be the focal point of any outfit. I love the mix of metals & natural stones. SO pretty!! I'm a sucker for jewelry, and I'll take each of these, please! How gorgeous is that cuff/bracelet? One of y'all will win ANY TWO pairs of EARRINGS from Lots of Jewels. SCORE! I'm officially jealous. Last, but definitely not least, we have Sugar & Dots. Kimmie has a blog that I love to read and giggle at. Her sarcasm and wit has me rolling often. Not only that, but she has a fun handmade shop on etsy with felt bows, family trees, and more. Kimmie is generously offering one of you readers a chance to win a CUSTOM family tree PDF. Are you kidding me?! SO cool ((and perfect for Mother's Day!)) It gets even better...she is offering ALL of you 50% off your Sugar & Dots purchase through the remainder of April with the code SWEETJOY. Booyah. 1. Visit these shops & let me know what is catching your eye in at least one of their shops. over on @ohsweetjoy's blog! http://tinyurl.com/2ddk985"
Love the pink rose bracelete at Lots of Jewels! I ABSOLUTELY LOVE the "Red Poppies Hair Garland - Felt Floral Headband" at Ordinary Mommy!! It is SOO ADORABLE!! Sugar & Dots: The hair clips are super cute! Ordinary Mommy: I love so much stuff in her shop! Spiced Blueberry Embroidered Lace Necklace - Tea Rose Series & the color progression felt necklaces are my favorite. 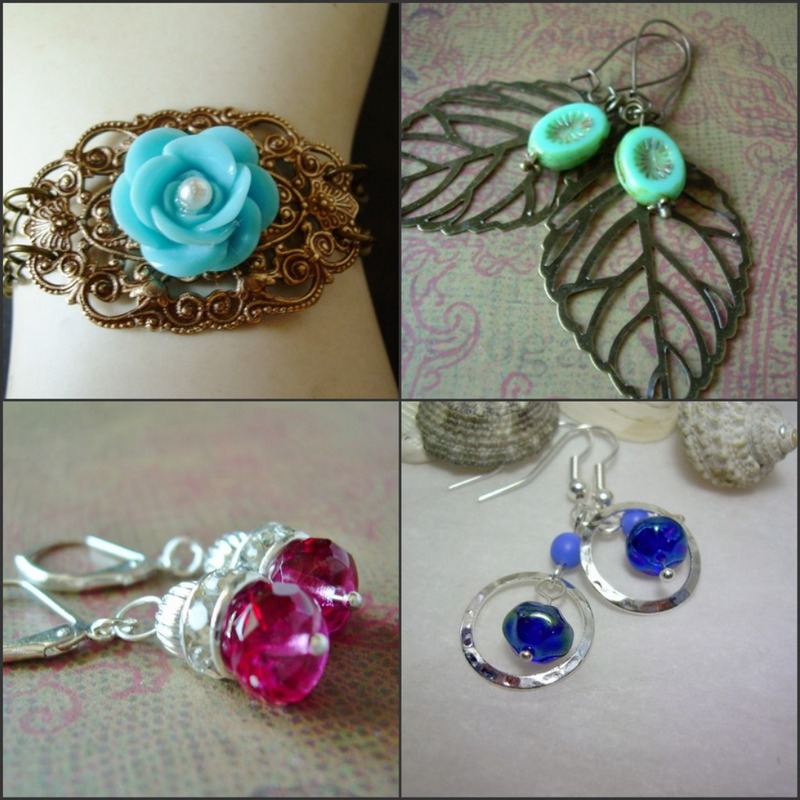 Lots of Jewels: Love the Vintage Topaz Octogon Glass Earrings & the Antiqued Bronze and Frosted Orange Petunia Flower Bead Earrings & the pink rose bracelet! And... the pink posey earrings by Lots of Jewels. Ordinary Mommy - Little Miss Providence hanging owl! Lots of Jewels - Vintage inspired Rose Cab Bracelet! Sugar & Dots - Love the number art print & the family tree would be AMAZING!! Loving the Vintage Pearl Filigree Leaf Necklace from Lots of Jewels! I like the wee felt buntings from ordinary mommy. i love lots of jewels' earth girl earrings. I love the blue and gray felt owl!!! I love owls!! How exciting! heavens! ordinary mommy is so darling. i want any of the owls! WANT! ummmm i just saw your comment to anonymous on JCA and am dying! i didn't even know it was there! i love you entirely too much. I pretty much love EVERYTHING in Ordinary Mommy's shop! I mean seriously!!! I just adore her Double Carnation Felt Headband in Sea Blue Flowers!!!! Ordinary Mommy: I love the carnation headbands and the mini bunting necklace! Lots of Jewels: Cloudy Sky and Sunny Day earrings stole my heart! 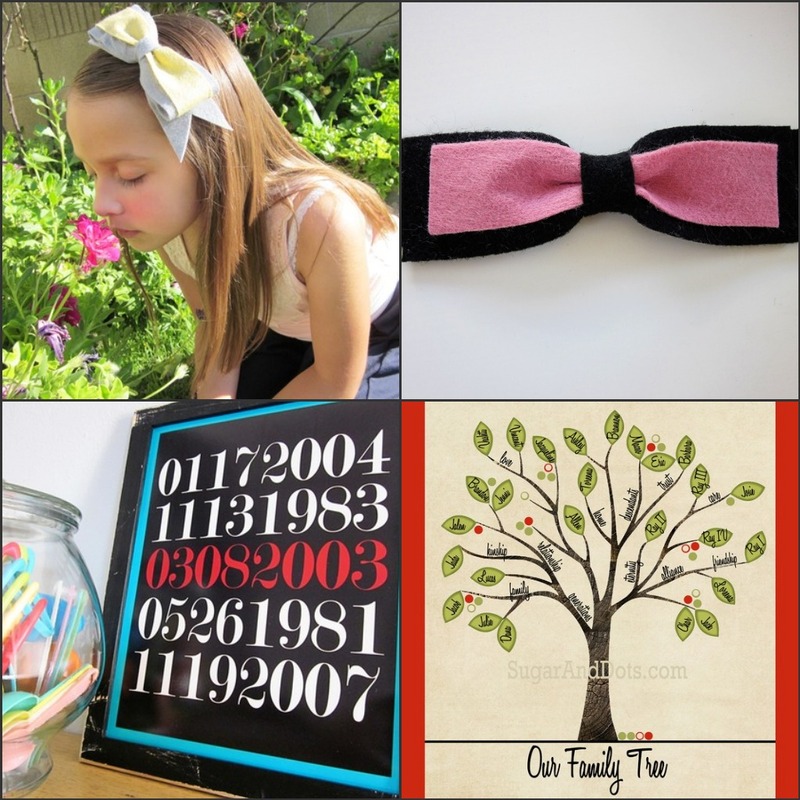 Sugar and Dots: I super love the family tree, it would be perfect for our art wall! Ordinary Mommy - I LOVE the owls - all of them! Lots of Jewels - The Festival and Flower Power Earrings. I LOVE paper beads! Love the festival earrings at Lots of Jewels! These items are lovely! For one thing, the Vintage Inspired Cab Rose Bracelet caught my eye in the LotsOfJewels shop! Thanks for the great giveaway. 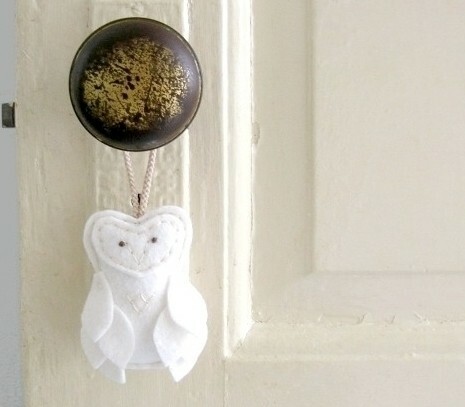 All of the Ordinary Mommy owl things are super catching my eye! I absolutely love the lilac mini-bib necklace from ordinary mommy! I love the simplicity of the pink rose glass earrings from Lots of Jewels! Cascading Leaves Handmade Felt Necklace from Ordinary Mommy is really fun, i love the leaf detail! 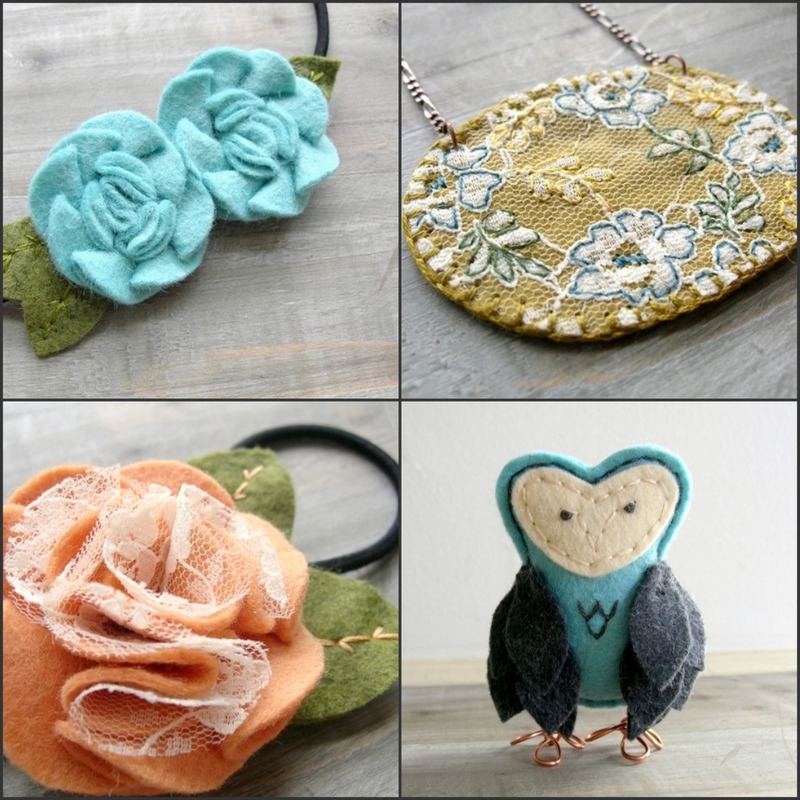 I love the Daisy Felt Headband in Bronze with Moss Leaves by OrdinaryMommy. I absolutely love the personalized family trees from Sugar & Dots! saturday snapshot ((no link-up)) take 7! He leads me beside still waters..